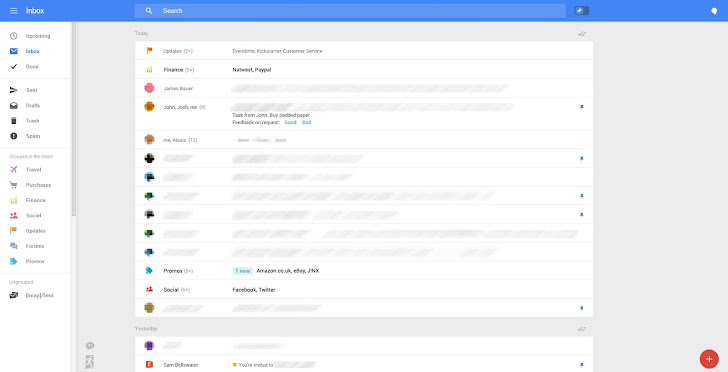 Google is reportedly testing out some new UI changes for its popular email service, Gmail on the desktop browser that would redesign your inbox in totally different Interface. So, the traditional Gmail we all know may soon get a new makeover and we hope users will definitely love it. Google has invited a selected team of users to test a completely new user friendly interface for the webmail client which appears as a part of the trial, according to the leaked screenshots obtained by Geek's website. According to the report, we can only presume that the new feature will enable a user to have a fancy access to Google's Gmail with a brand-new fly-in menu system that flies in and out of the browser window replaces Google's otherwise static sidebar on the left bolted into Gmail last year that organizes your inbox, chats, and labels. In the beginning of the April, the Geek also provided the screenshots revealing a series of new feature for the mobile Gmail client. So, it can be assumed that the goal behind the changes is to make Gmail work friendlier with the Google's mobile version of Gmail and with an expanded array of desktop sizes and resolutions without losing any functionality in the process. Google has habit to test new features for its various products but on the same time, it typically changes Gmail slowly. So, just on the basis of leaked screenshots, it cannot be guaranteed that Google will soon or will ever propose these changes to its Gmail service. But, still it gives an idea of what Google is thinking next about Gmail. The traditional Gmail offers you the Star system as away to highlight the important emails, which have been replaced with a new Pinnig system. This pinnig approach will offers you options for your pinned emails to always display at the top of your inbox, or revert back if you want to see everything in the order it arrived. A switch to flick between the full inbox view and only pinned messages is at the top. The left sidebar tabbed system currently offered in Gmail, has now been changed to a "grouped in the inbox" system that automatically sorts your email by topic such as Travel, Purchases, Finance, Social, Updates, Forums, and Promos, in order to keep your inbox manageable and organized. Till now, it’s not at all clear if you can edit or modify these categories. A big Plus "+" icon is added in the Gmail's lower-right corner that offers a new pop-up menu for composing new messages and adding new reminders into Gmail. Also Google Hangouts is integrated into the new Gmail interface, now you just need to click on the chat-bubble-like icon at the bottom right corner of the display in order to pop out a sidebar that allows you to chit-chat with your friends and make video calls. 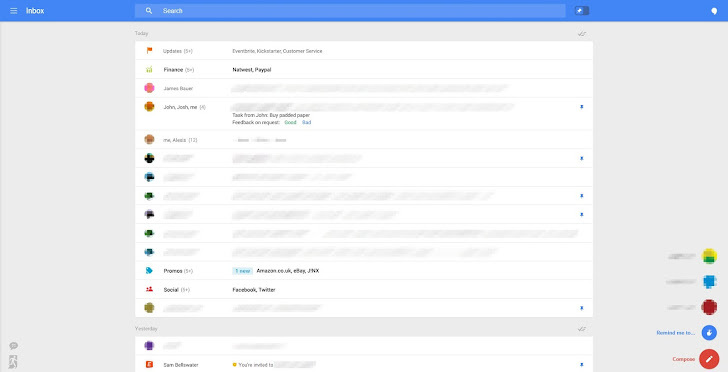 "There's no expected release date for any of these features, or even a guarantee that Google will implement them in the way we see them in these images, but after spending a few minutes in this interface it is clear that Google is eager to shake things up in Gmail. With any luck most of these features will make the cut and we'll see an all new Gmail any day now," writes Geek's Russell Holly.